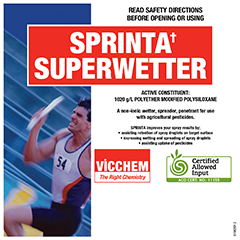 SPRINTA Superwetter is a nonionic wetting agent of the organosilicone type which is compatible with a range of agricultural products. It can be used in most water qualities, however avoid mixing in strongly acidic or alkaline situations such as acidic buffer products. SPRINTA Superwetter will reduce the surface tension of water to about 22mN/m when applied at 0.1%v/v which is significantly lower surface tension than most other nonionic wetting agents (typically about 30mN/m). The reduced surface tension enables far greater spreading of spray deposits, especially in difficult to wet situations. In certain situations, spray volumes can be reduced without compromising spray coverage. Avoid using in very high water volume applications as SPRINTA may increase run-off and loss of active ingredient. When applied with the fungicide Rubigan to control powdery mildew on grapes, SPRINTA provided superior control to Rubigan alone or Rubigan with a Nonylphenol nonionic surfactant (NIS). The difference was most notable within the bunches where SPRINTA enables the fungicide to spread more effectively on the difficult to wet grape surfaces. SPRINTA significantly enhances the activity of both of the systemic insecticides Dimethoate and Pymetrozine. The greater efficacy is attributed to the adjuvant’s ability to increase spray droplet retention and improve foliar uptake. 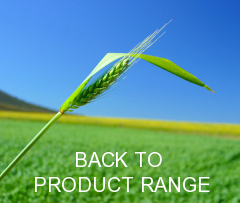 General use with fungicides, insecticides and foliar nutrients 30 – 60 ml/100L spray volume. For general use with Herbicides, apply SPRINTA at 50 – 200ml/100L. Use the higher rate when applying low water volumes or when controlling very difficult to wet weeds such as Gorse bracken or woody weeds. For more information see SPRINTA label and always refer to the label of the products which are being used with it. When using SPRINTA Superwetter for the first time in sensitive crops test by applying to a small area and check for symptoms of phytotoxicity before large-scale use.